During the time that I worked as a flight controller in the Mission Control Center – Houston, I often monitored some of the downlink video from earth- limb viewing cameras aboard the Space Shuttle. The limb is one of the best places to look for meteors that encounter the earth’s atmosphere. 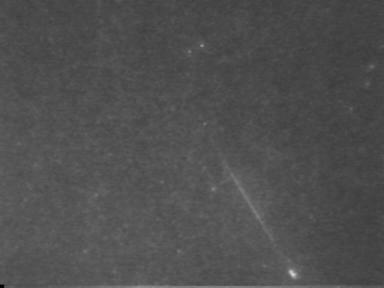 The following images show a typical meteor burning up as it flies through the space over Houston, Texas as seen from low earth orbit. The meteor is located in the lower left corner. It is extremely faint on this first web image as it begins to move from left to right. The brightest point-like object at the very top of the frame is a star. The meteor is now fairly bright and to the lower right of the star. The faint horizontal band at the lower portion of each frame is the air glow layer. Also, the bright patchy glow at the bottom is the city of Houston, Texas, while the light patch in the center is San Antonio. Austin is to the immediate right of San Antonio and appears as a horizontal glow. The meteor has moved still further to the upper left in the direction of Houston and is fading out. My original plan was to observe in from Fort McCavett, Texas. This would have been a 7-hour drive each way just to get a glimpse of what might be a repeat of our exciting experience in China during the 1998 Leonid “night of the fireballs”. However, on Wednesday, November 14, it became apparent that the weather in Texas was not going to be favorable. Lynn and I, instead, elected to fly to Phoenix, Arizona where we would take our chances on trying to get clear skies. I planned to observe on two nights — November 17 and 18 realizing that the morning of the 18th was the predicted maximum for North American observers. On Friday, November 17 I flew into Phoenix on Southwest Airlines using a free ticket I had earned the previous year. Renting a car, I made the drive through dry desert air to the town of Maricopa where I watched local townsfolk standing by the railroad tracks watching the big event of the day—-a train passing through the middle of this small berg. I continued on past Highway 8 and found the dirt road which led to the East Valley Astronomical Society site near Vekol, 1.5 hours southwest of Phoenix. I arrived at the desert locale at 5pm. One vehicle had already arrived earlier. By nightfall, only three other cars had shown up and all of us spent the night watching the sky, surrounded by cactus and howling coyotes. We observed the moon soon after sunset as a tiny thin crescent hovering over the mountain ridge in the distance. To the north, the Phoenix light bubble gave a contribution to skyglow, but the limiting magnitude of the sky here was around 5.5. The complete absence of clouds and rather cool temperatures (34 degrees) made it a decent night. My equipment consisted of one tripod with 35mm camera and 24mm fisheye lens, and a low light level video system that I normally use for satellite observing with a 15mm lens giving a 20 degree field of view. I also had brought a 4inch by 5inch format camera that I had bought many years ago. I had also bought a Russian Zodiac 30mm f/3.5 lens that gave an all sky view on this format and had it mounted to the Graflex camera back. A new problem appeared when I learned that the TRI-X film I planned to use was no longer being manufactured. In fact, I had to purchase TMAX 400 film which I thought would be suitable. This night I had carried 3 plate holders and the film to the desert site thinking I could load the film in complete darkness. I could see that the overall sky brightness at Vekol simply would not permit me to load the film! I decided to wait to load the plate holders until after I returned to the hotel. 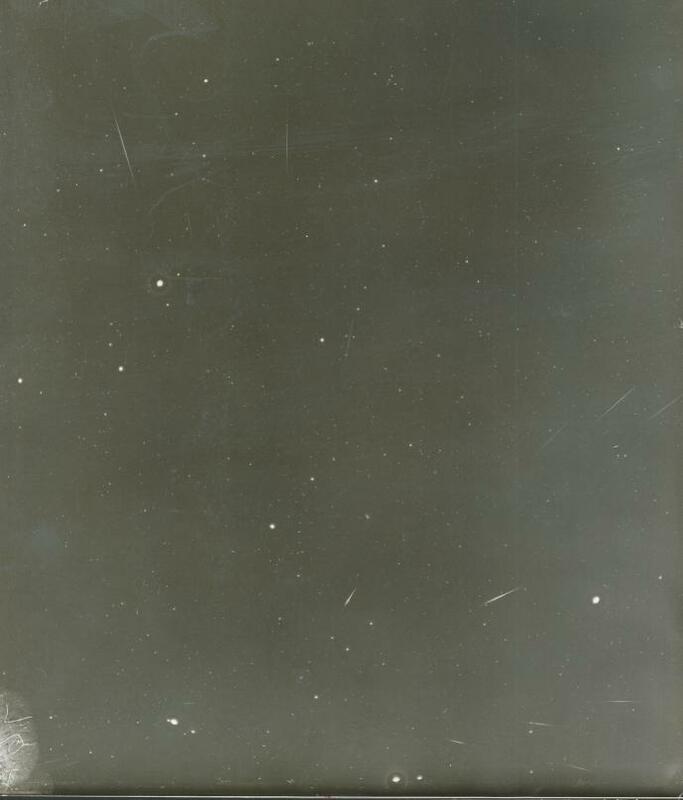 Two Leonids cross the same field of view in the images above. 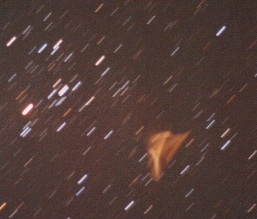 One flares brightly, while the second in lower center, appears almost star-like as it begun to fragment. 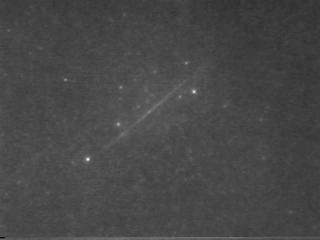 These images are from a 3rd generation image intensified system with CCD camera. They are notably improved from the 2nd generation system used in 1998. The only problem is that the field of view using wide angle lenses is relatively narrow due to the camera chip size and the fact that there is no lens on the CCD camera. The camera is looking directly at the output of the relay lens in front of the intensifier. Serious Leonid observation commenced from 2am onward with my video pointed 30 degrees above the southern horizon until 6am. A few Leonids were spotted over the next couple of hours. By 4am the zodiacal light beamed up from the east, the glow rising nearly 60 degrees in altitude as seen from this site at 1800 feet above sea level. Still, the meteor activity was low and I packed up to leave around 6am without much to show for it. Not one single fireball had been up to now. As I began to drive slowly past the remaining vehicles with dawn breaking in the east, a brilliant fireball left a train that lingered for at least 20 seconds. Of course, my video equipment was already packed and I could not record it. Proceeding back to my hotel, the Marriott Camelback Inn in Scottsdale, I waited till Lynn arrived at the airport that afternoon. But the first order of business was to load the 4×5 film holders. I found a closet inside the room and put towels under the door to keep light from coming in. Then, feeling around in pitch black darkness, I carefully felt for the notch in each film and slid one 4×5 film into each side of the 3 cassettes. By noon, the weather had begun to deteriorate with high clouds moving in from the west. I had contacted the weather bureau every 6 hours to check the forecast. They predicted broken high cirrus clouds all over the state. Chances might be better toward the northeastern border with New Mexico (four corners area), which was quite a long drive. At 3pm we began to move north toward Flagstaff arriving there just after sunset. It looked like if we drove eastward the skies might be better. At Winslow, about 50 miles to the east of Flagstaff, we encountered two policemen at a gas station. I asked them about a possible meteor observing site and they recommended two places. We selected one not far from the famous impact site of Meteor Crater at an altitude of 5500 feet. By 9:30pm the cloud situation had changed from one of nearly clear to complete overcast. Lynn suggested that we just stay at this site instead of chasing clear sky, and that is what we did. About 12 am clouds began to thin just a bit but large opaque sections of cirrus made viewing the sky problematic. By 1am things looked better. I had set up my Takahashi mount with the “all sky” 4×5 format camera and an old Nikormat 35mm camera with a 15mm wide angle. The video system with 24mm lens sat nearby. As the sky alternately cleared and then clouded over, I tried several 4×5 shots. In the darkness, I failed to note that I had accidentally unplugged the tracking system after shot number 2. This meant that the mount remained stationary for the rest of the night. But that was not the worst of it. A short but bright Leonid of perhaps magnitude +2. I had set up my video and tried several different lenses that I had used successfully in past years. This year I was using a new image intensifier. The focusing range was rather limited. My favorite lens was an 8mm fisheye. This cool lens just would not focus no matter what tricks I tried. I gave up and settled on the 24mm lens which gave me much less field than I needed. After all, Leonids can appear anywhere in the sky and the larger the field of view, the more likely you will capture many meteors. Meteors began to make themselves known after 1:45am and I began to notice repeated trends that made me think of 1998. When you watch meteors for hours on end, you begin to notice what you believe are certain tell-tale signs of activity. For example, meteors seemed to be appearing close to the radiant in Leo as opposed to other places in the sky. Leo was about 15 degrees above the horizon at this time. Notably, the meteors would appear to be about +2 or +3 magnitude with short tracks as you would expect appearing within 30 degrees of the radiant. One or two streaked across the sky spanning perhaps 70 degrees in length. A meteor of magnitude +4. The predicted maximum time was supposed to be around 10 hours UT or 3am MST. As the radiant rose higher in the east, the tendency to see meteors expanded to various other parts of the sky. Also the faintness of the average Leonid began to be apparent. Lots of +4 and +5 magnitude meteors in addition to those of +2. Some faint meteors covered very short arcs before dying out. Their visible life seemed to be under 1.0 second. The above meteors are typical of those recorded that traveled very short distances on video. The faintest star is magnitude +7 in the lower frame. My video system covered only 1/86 of the sky. So, I was always excited as a meteor shot through the 10 degree field of the 24mm lens. 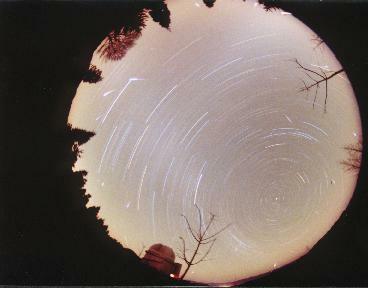 As time would pass, I rewound the 35mm camera and changed its pointing direction as meteors seemed to direct. By 3am meteors began to be seen in twos, threes and fours in one second. No great fireballs were noted. I had several techniques to use. The first was to point the video and let a meteor fly through it (stare mode). The second was to wait for a streak to occur, then rapidly whip the system around and point where the streak had appeared. This latter method allowed me only to capture a number of disappearing trains. A typical train remnant that lingered for about 1 or 2 seconds before vanishing. It took 1-1.5 seconds to move the system and I was able to grab quite a number of trains that had not quite dissipated or were in the process of disappearing. The objective was to luck on to a long-lived train that might be affected by winds in the upper atmosphere. But this is usually reserved for the brightest of fireballs and tonight was no exception. The last method was to randomly move about the sky following the ‘clustering’ groups of Leonids. Between 3 and 4am the sky had virtually cleared up. The whole sky now was available for meteor viewing until nearly 6am. One of the great frustrations is not to be able to see all of the sky at the same time since you know that lots of cool things are happening elsewhere no matter where you are looking at the moment. The cold temperatures at this higher elevation site were not distracting, since the excitement of the Leonids far exceeded the discomfort. Every direction I turned, I saw Leonids. Sometime there were as many as 5 in the same 1 second interval. Sometimes there were gaps where no Leonids were seen for several minutes. There were intervals where I walked away from the video and it made no difference where I left it pointed. A meteor would likely shoot through the field. As the radiant reached an elevation of 50 degrees above the eastern horizon, we saw congregations in the south east. As 5am neared the clustering tendency moved to the west and then to the north. 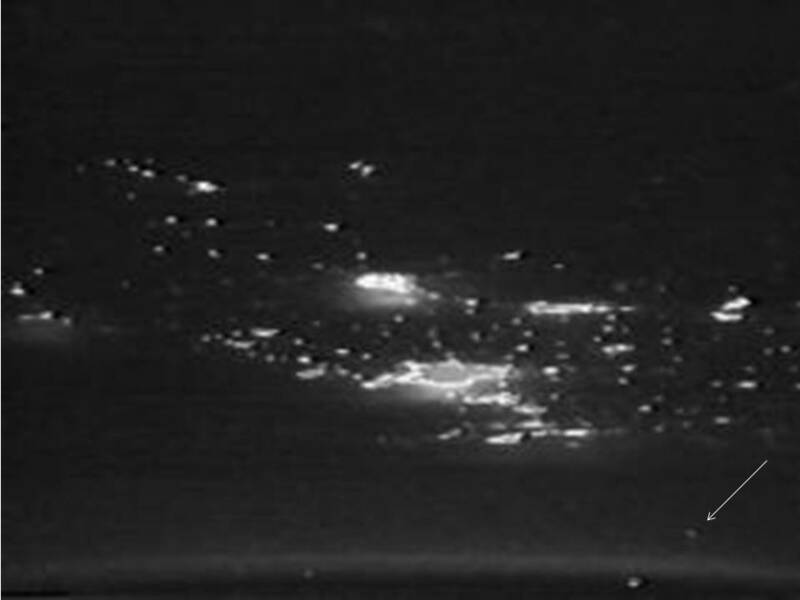 This was not an artifact since the same horizon clustering was apparent in China in 1998 though the details are not known accurately since too much was happening and we could not cover the entire sky effectively. If I compare this experience with 1998, I would say the number seen, magnitude range and frequency were similar with the exception of the brilliant fireballs. There were so many meteors that my voice had been running out of steam since 4:30am. At times I just let the video record without any commentary. There were just too many meteors to talk about and I was very tired of commenting. I am estimating (without having had a chance to listen to the audio on all 4 hours of tape yet) that I saw in my instantaneous visual field of view about 600 meteors but this is just a guess. I changed view points with time as things progressed. My eyes were not constantly staring and logging meteors, so developing an accurate per minute bin count is not possible. Within 30 degrees of the horizon seemed to be the best place to see lots of Leonids. In China too this was also characteristic of the place where the majority of fireballs were spotted. I could point the video at one spot and meteors would pop through the general area over and over. During the 2am-6am period only 2 fireballs fell into the class I denote as ‘flashbulbs’. A ‘flashbulb’ is my unofficial term for a meteor that lights up the ground as if somebody used a flash camera. In both instances the flashes happened behind me and, by the time I looked around, the evidence (train) was gone. By 5:30am it would be time to finish the 35mm exposures. The last 4×5 frame had already been taken. The northern horizon seemed to hold the most activity; by this time the radiant was nearly overhead. I was ready to start tearing down equipment but remembering the experience of seeing my one bright meteor the previous morning, I decided to resist temptation. It was a good thing too. At 5:52am the best meteor I had seen since 1998 appeared about 45 degrees above the western horizon. I was looking straight at this spot when a bright light appeared. I was able to get the video onto the spot and the light barely moved but increased dramatically in brightness. I thought it might be a satellite reentry. From the video record it took a full 10 seconds from the time I began to tape it until it dimmed out. The stationary appearance implied that it was a fireball that had been coming nearly straight towards me! It reached magnitude -10 perhaps and left no train and there were no sounds. It was not even a Leonid!! Yet, I captured it on video and this had to be considered a success. 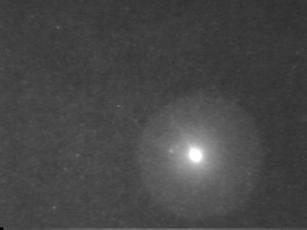 The image intensifier was saturated as the meteor moved across the field. This is one problem with image intensifiers. The following frames were captured from the video showing the stages of its life. The 5:52am fireball during maximum brightness saturates the sensor. The slow moving 5:52am fireball well after reaching maximum brightness. The 5:52 fireball beginning to fade out in pieces. As dawn broke and only a few bright stars were visible, I saw one last Leonid which must have reached -1 magnitude briefly. I can also recall having seen fireballs in bright twilight in 1998. Back in Houston, I began to tally up the results of my efforts. 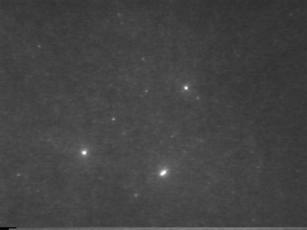 One 4×5 frame showed about 8 bright meteors. 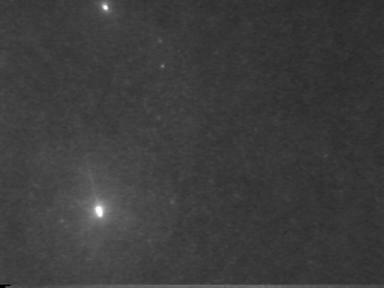 The f/3.5 lens was not much of a match for the Leonids, since nearly all meteors were of the high velocity type and were either moderate or faint in brightness. The worst feeling came after I had rewound the 35mm film from the camera into the cassette. I felt virtually no tension during the rewinding. I had used film that had been sitting around for about a year–not such a great idea. The lack of tension was odd because I had a winding problem to begin with and watched as the first part of the roll went around the spool and seemed to catch the sprokets firmly. I had a bad feeling after doing the rewind. Sure enough, the roll was blank after it came back from the developer. This was a huge disappointment. The video was a happier story. I could see the video recording in real time by watching the monitor. However, by the time the video ended I had less than 2 minutes of video tape remaining! Like a fantasy film, my account was not “101 Dalmatians” but the story of 101 Leonids, all captured on 8mm tape. Bright, medium, and faint meteors—all but one were Leonids. This included the sporadic 5:52am fireball plus two instances were two meteors shot through the same field within 2 seconds of each other traveling in the same direction. 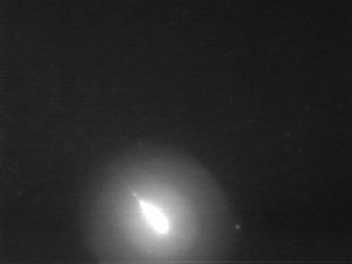 In addition, the video caught 93 meteor train remnants in addition to the 101 Leonids. By the time I locked on to each train, 1-1.5 seconds had elapsed. Hence the survivability of a typical recorded train was 2 seconds. None of the train remnants were anything more than a disappearing line. This is far different from 1998 when the brilliant fireballs created trains that lasted from 10 to 30 seconds and even up to 10 minutes in duration. This expedition was not successful, encountering first snow and clouds atop the mountain peak where we had originally planned our observation. Then encountering clouds at sea level where we had hoped to outrun the bad weather. Only a few Leonids were seen but our intensified video system performed flawlessly. This was a last minute decision realizing that the odds of getting clear skies were low at this time of year. 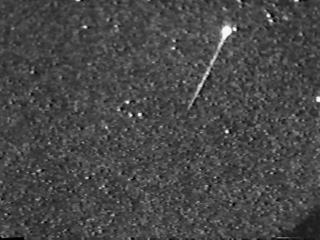 Lynn and I traveled from Houston to Beijing, China to observe the 1998 apparition of the Leonid meteor shower. Our expedition got off to a poor start after a bad weather system enveloped Houston on Nov. 12. We flew Atlantic Southeast Airlines from Hobby to Dallas with only a 30 minute connection time to another flight to Portland. Departing Hobby 15 minutes late and going through harrowing thunderstorms, our flight finally made it to Dallas 5 minutes after the Portland flight had departed. Delta Airlines then rerouted us on an American Airlines Dallas-Tokyo flight which would have arrived 3 hours earlier than our original Portland connection. We boarded the American flight only to sit for more than half an hour before the entire plane was evacuated due to a computer malfunction. American switched to another aircraft which finally took off for Japan. The 13 hour 12 minute flight landed with enough time to make the final Tokyo-Beijing segment on United Airlines and at 840pm Nov. 13, we touched down in China.We were invited by astronomer Jin Zhu to observe from the Beijing Astronomical Observatory at Xinglong, 170km northeast of Beijing on the nights of 15-17 November. Jin met us at the airport and briefed us on upcoming plans on the way to the hotel. Jin does not drive a car and was taking his driver’s test that week. We remained in Beijing for a bit over a day before being transported to the Beijing Astronomical Observatory (BAO) administrative facility on the northwest side of the city. As we were driving, the theme from “Titanic” was playing on the radio. Was it an omen to come? There we met up with some of the European observers before setting out on the 4 hour drive to the observing site. Arriving in early evening, we shared rather primitive observer quarters at a dormitory with some members of the Dutch Meteor Society. We had hoped for one of the 5 good rooms at the observatory but they were all taken. The resulting accommodations were a short walk from the mess hall and several flights of stairs up to a block of three small rooms. The front door had a lock which was very hard to open. The first day there, as we tried to leave the building, we found the door lock jammed. It took more than 15 minutes of work to nearly break the lock open to get out of the building. Almost as complicated was the actual room lock which had to be slammed to close. None of rooms in the dorm had a bath or shower and those were already committed in other buildings. There was a basic flush toilet with a sink and glacial cold water. The presence of what appeared to be a bed pan beside each bed did not add to the overall enjoyment. However, we were able to get a bar of soap and a small towel big enough to dry a small cat. A window in the bathroom let in the bitterly cold air. Radiators provided heat which operated at unpredictable times. Every sound made in the building could be heard by everyone in it. This was the typical observer conditions at BAO. The BAO site is 950m above sea level and contains a series of domes and telescopes with telescopes of former east German and Chinese origin ranging from 25cm to 2.16m in aperture. We spent some time using the incredibly slow internet access in the Schmidt dome but some of the staff would begin to smoke in the control room and that was very difficult to be around. After scouting the facility we obtained permission from Prof. Hu, the senior observatory fellow, to locate our site next to the dome of the 2.16 m telescope. 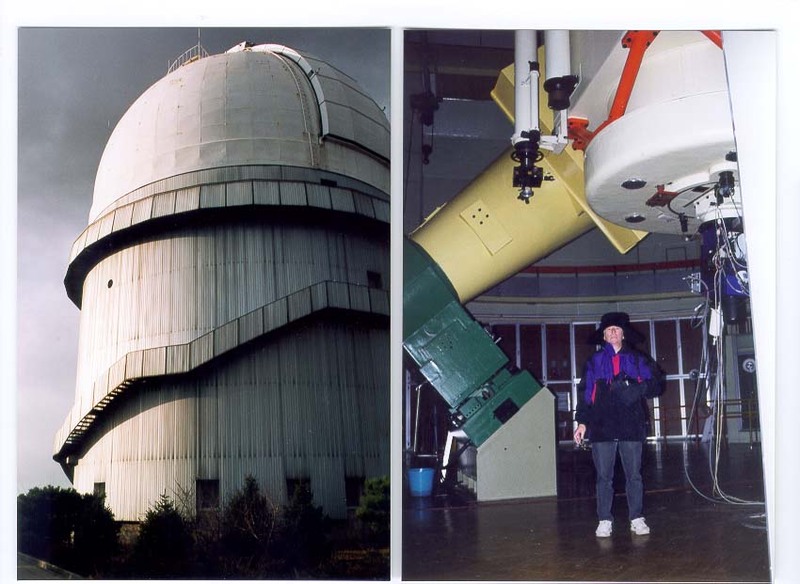 It was amazing that the facility was so open to amateur astronomers and they were extremely pleased by the courtesy; and openness that the Chinese astronomers showed. The Dutch amateurs had been there a week and every night was clear until our arrival. The first night, Nov. 15 was overcast due to an immense region of clouds which had also caused complete fogging over of the sky during the daylight hours as well. A plan was being readied to fly to another Chinese city if the forecast looked unfavorable for the following two nights. However, they were told it would improve. On Nov. 16, a cold dry airmass moved in and the sky cleared at sundown. 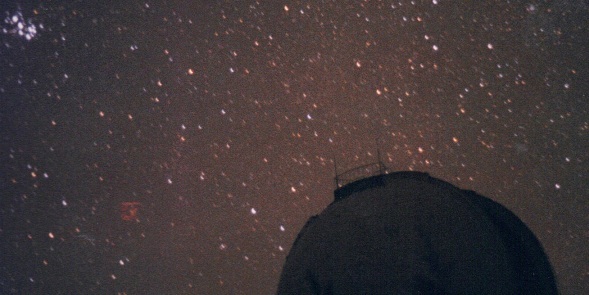 Formal video observations began when the Leonid radiant appeared on the horizon. Temperatures hovered at -10 C degrees most of the night; since we did not have enough cold weather gear, we had to periodically go in/out of the building to maintain warmth. Even with ski clothes, gloves and Russian hats, the cold was overpowering at times. We were lucky to find a small anteroom with a heater and enough space to store all our equipment. I conducted a dual program. Several two hour long still photos were attempted with a Nikon 8m f/2.8 fish-eye lens and ASA 800 Fuji film. Intensified video was recorded on Hi-8 video tape and with a 24mm f/2 objective lens. Lynn performed visual meteor counts logging Leonids and sporadics. The field of view was constrained to the sky east of the meridian due to blockage by the multi-story telescope building, which was also necessary to serve as a windbreak from strong winds gusting 30-40 knots at times during the night. Limiting magnitude was estimated at +6.0 with the naked eye. Limiting magnitude with the 24mm lens on video was +5.5. Observations were conducted from 1500 to 2200UT (11pm-6am local time). Activity began to pick up around 1810UT with 3-4 Leonids observed per minute in the eastern half of the sky. Six Leonids per minute were recorded at 2022 and 7/minute at 2038 sustaining through 2118. A faint, small reddish train to the left of the dome. The average Leonid then was +1 magnitude with a smoke train that vanished after less than one second. However, there was an impressive display of brilliant fireballs somewhat reminiscent of 1966 except for the much lower rate per unit time this year. At least seven were observed whose trains persisted for 5 minutes or more; some of these were also recorded on video (20 degree field of view) where the motion of the train was evident over time. Some occurred directly behind the dome creating flashes that were seen to illuminate the ground to either the right or left. No meteors produced audible sonic phenomena. The brightest fireball seen was probably -10. Even if one wasn’t watching you could hear the shouts of people around the site as they saw one fireball after another. As one flash appeared people would run about to see what was left. Often it was a snake like smoke pattern, sometimes in linear form, othertimes like a semicircle or corkscrew. You could see the upper atmosphere winds at 100km distorting the trails slowly with time. The above are two examples of long lasting trains. 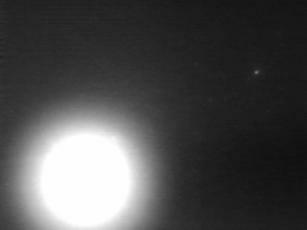 My all-sky camera revealed more than 20 fireballs in a one hour long exposure generally close to the horizon. The camera was a Russian Kiev 88 with a Zodiak-8 f/3.5 lens. One thing that was noted was a near complete absence of Leonids fainter than +3. Video recording had to be terminated at 2145 due to impending twilight, but one observer stayed up to see the last fireball actually spotted right at local sunrise time at 2300UT! Several flying pairs of Leonids were spotted during the night; these were characterized by two meteors of about the same brilliance occurring within seconds of one another in nearly the same place in the sky. One flying pair was captured on video. The fish eye lens was located about 200 m from the dome in an open area precariously perched on a ridge to record the whole sky. After this all night vigil we obtained a few hours sleep before lunch at 1200 noon. The observatory provided 3 meals a day which, though simple, were very tasty. Usually there were about 40 people eating at one time, mostly Chinese. Prices of the meals ranged from .6 to 3Yuan which amounts from 7 to 36 cents. Any movement outside in the open was very difficult because of bone chilling cold so it was a tough decision to leave the dorm just to eat a meal. But one could get Coca-Cola, bottled water, rice, vegetables, sometimes fish and always meat dishes. The chefs were great and often came out to see if their foreign guests were happy with the food. Though communication was impossible except through our English speaking hosts, there was a general level of their understanding as to how much we appreciated a hot meal. Since all of my equipment was battery powered, it was necessary to perform hours of recharging during the daylight hours. A 20-hour gel cell battery performed extremely well even under cold conditions. A simple transformer allowed the 220V 50cycle power to be converted to 110V 60 cycle. Lithium batteries for the Sony camcorder also worked well and a new 12-hour battery really saved the day. One result of the cold was that an immediate reduction in battery power of about 30% from the fully charged level occurred as the battery was switched on. Even so there was enough reserve to cover the 7 hours of operating time each night before recharging. On November 17, over two hundred journalists and invited guests descended on the mountain, a 3-4 hour drive from Beijing. It was even worse at the other site located about 75 miles away. There some 5,000 observers and the general public were expected. At Xinglong, the foreign observers were formally introduced to the press followed by a question/answer session. The Dutch observers had two teams totaling 18 observers at two sites and had developed a very thorough program of multi-camera stations and video. They occupied a large open site which is later scheduled to be the location of a new 4m telescope. We once again based our equipment in the 2.16m dome. Anticipation was quite high that this night was going to produce a great meteor display based on the preview seen the night before. There was an announced rule that no white lights would be permitted beginning 1.5 hours before the meteor watch, yet there were careless people violating the law. Two guards walked down the steps and upon seeing us, lit up a cigarette lighter for illumination purposes. After being yelled at they never appeared again. Even the Dutch observers used white lights to change out their film but fortunately they were positioned several hundred meters away. The brightest part of the fireball passes over Betelgeuse (Alpha Orionis). Procyon is to the lower right of the beginning of the tail. Castor and Pollux are the two bright stars located very close together in the center of the field. Sirius is the bright star at the rightmost edge. 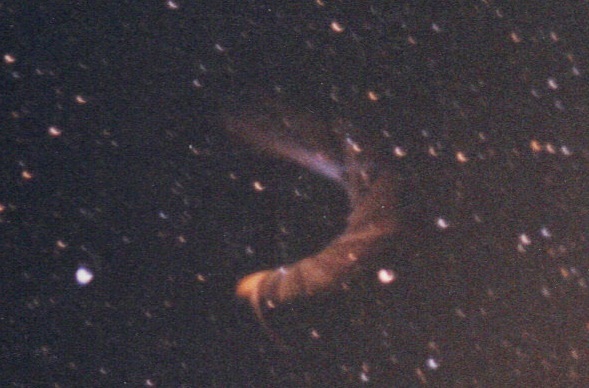 Estimated magnitude of this Leonid was -5. A 24mm lens was used with an older 2nd generation image intensifier and CCD camera. The wider the angle of the lens, the less likely it is to get crisp electronic video images to be captured by frame grabbers. The stars tend to get smaller and blend in with the electronic noise. Observations again were conducted between 1500 and 2200 UT with temperatures dropping to -13C with some wind. A complete lack of reception of time signals on 5, 10, 15Mhz was noted. Conditions were even more difficult on this night with visibility slightly reduced to a limiting magnitude of +5.5. The cold made it impossible to stay out for more than 15 minutes at a time. The number of meteors was considerably lower than the previous night and the typical Leonid was around +1. From 1630-1640 UT only 2 Leonids and 2 sporadics were seen. Based on this initial watch, the prospects for a storm began to look very grim. At 1801UT there were three Leonids seen in one minute but for the prior 10 minute period, none were seen. In an 8 minute period beginning at 1900UT only 5 Leonids were spotted. But this time there were more meteors observed at the +4 magnitude level and fainter. At about 2002UT the rates picked up to 4-6 per minute in the eastern half of sky and remained at that level for 3/4 hour before dropping back to 2-3/minute. On this night there was a near complete absence of the spectacular brilliant fireballs seen on Nov. 16. One ‘flying pair’ was recorded on video tape. Because of a problem with the 24mm lens, the fish eye lens was attached to the video to cover a field about 75 degrees wide with a limiting magnitude of +4. This proved to give a very outstanding field of view. Of course, one never new where/when a meteor would appear. The setup only detected meteors of +2 or brighter. The resulting distribution of meteor brightnesses was logged by Lynn on both nights and is an accurate representation of the different types of meteors that were seen. This had been one of the principal objectives of the expedition. As sunrise drew near, our observations terminated. A tiny thin crescent moon signaled the impending sunrise and everyone on the mountain began the process of packing up. After turdging back to the Schmidt telescope dome a number of cars were stalled out in the cold blocking the single lane observatory roadway. We had luckily arranged a ride back to Beijing with two friends of one of the astronomers and in 2.5 hours were back in the city. Much of that ride was spent dozing due to lack of sleep over the past two days. Fortunately the driver had been sleeping most of the night through the meteor shower. Because of horrendous traffic it took another hour to get to the Holiday Inn Hotel. Skies were clear in Beijing and for the first time in three days they had access to a shower and actual central heat. That day a brief account of our observations were mentioned in the newspaper CHINA DAILY. Reading through some of the newspaper accounts we learned that four deaths were attributed to the meteor shower and these occurred in Japan. Sendai police reported that an 18 year old driver turned into the path of an approaching car driven by a 24 year old on a prefecture road at 3:25am. Two people died in the crash as one driver was distracted by the shooting stars. In Kiyokawa a 19 year old woman was killed when she fell off a bridge railing while trying to retrieve her shawl blown away by the wind during the meteor watch. Southeast of Tokyo a 73 year old man was knocked down and killed by a truck whose driver was staring upward at the Leonids. Tokyo police also recorded 181 nuisance complaints of noise caused by crowds of skywatchers. Hong Kong police reported more than 30,000 people flocked to the beaches, hills and other vantage points to watch for meteors. In northern Thailand tens of thousands of tourists swarmed to Doi Inthanon, Thailand’s highest peak at 2565 meters. However, clouds and lightning hindered the viewing. In Mongolia a USAF observation site was hampered by an accident that knocked out the satellite phone at their site 50 km from Ulaan Bataar, and a fire destroyed one of the camp’s three tents. But even there, Leonid counts were about 150-200 per hour, a far cry from the thousands per hour predicted to occur. Photo results: three exposures were taken on ASA 800 film which resulted in the entire sky being recorded. There was a visual tendency to see many bright fireballs near the horizon. The photos showed this to be true. While it is not clear the minimum magnitude needed to record on this setup it is believed that a -1 or brighter fireball would be recorded. All three pictures were shot on 16 November. The first frame was 2 hours long from 1530-1730UT and only 2 fireballs were recorded. From 1731-1953UT, 12 fireballs were logged. 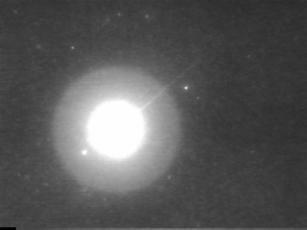 Finally, from 1953-2138UT, there were 36 fireballs present. I had also made arrangements to feed some of my video to the ABC News facility in Beijing and this was successfully sent. Part of an agreement with the Chinese was to have the official Chinese TV station rebroadcast some of the JSCAS expedition video. 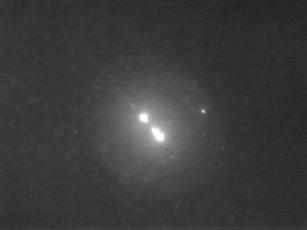 One ofmy tapes showing some prominent Leonid fireballs was borrowed by the TV outlet and was shown at 10pm that night to Chinese audiences. On Nov. 19 our mini expedition returned to Houston after 4 flights totaling about 18 hours. Some of this same video was then shown on the Discovery Channel back in the US on Nov. 20. Beijing Observatory. Lynn Palmer photo. I first experimented with image intensifiers in 1972 when Andy Saulietis allowed me to test a NASA first generation image tube. I had always felt that meteors of the smaller size variety (that is, those not seen with the unaided eye) were understudied and this seemed like an area worth reviewing. On November 5, 1972 at Sandy Point, Texas I tested a 75mm f/1 lens with a 30 degree field of view centered on Sigma394 Arietis. Using the intensifier I could spot stars down to +8 magnitude. 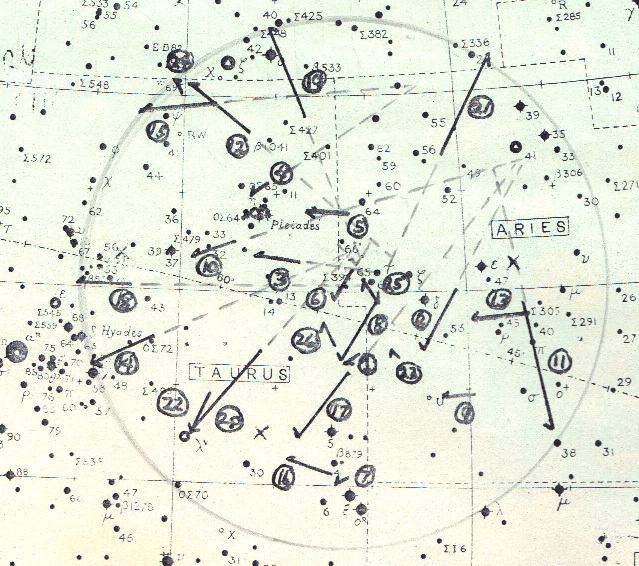 The results are shown below in the diagram using a Nortons Star Atlas chart. One set of observations manually plotted one by one on a Norton’s Star Atlas from a 60 minute observation period. Frame holding the meteor viewing device. An electronic image intensifier with eyepiece at the top pointed down to a flat surface mirror at a 45 degree angle. The data reveals 26 meteors from 02.57 to 04.09UT with breaks interspersed to avoid eye fatigue. Backtracking the paths reveal several radiants, one of them belonging to the Taurids. The implication is that there are other minor meteor showers ongoing during this period that would go unnoticed by the typical meteor observer. After further testing over the following months the level of effort required made it impossible to continue due to the strain and time constraints needed in order to complete such a project. In addition, it was not easily possible to observe for hours on end without some method of video recording and automatic reducition. The methodology of detection, however, was clearly proven. 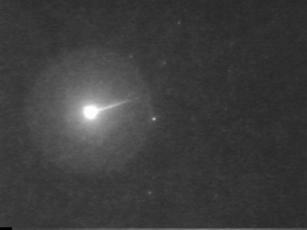 I was an undergraduate student at Pan American College in Edinburg, Texas at the time of this meteor shower. An expedition of students was organized to observe at Moore Air Force Base, where the College had a fixed observing site to support the GEOS-A photographic program. Located west of Edinburg, the base was relatively dark and was a good place from which to observe this shower. Even though it was located at low elevation, the sky was clear and dark on the morning of November 17. Leo itself was high in the eastern sky as dawn approached. It was around 1100UT as I recall when we began to see a large influx of meteor activity. 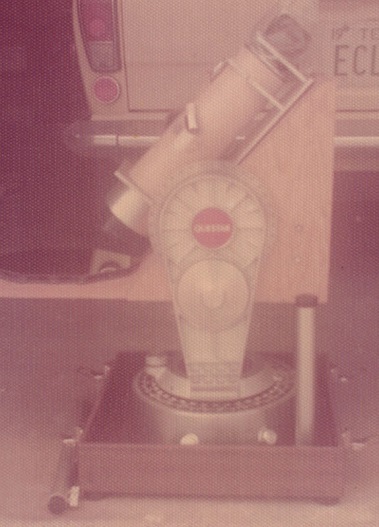 A large format plate camera was used to image the radiant area. Plate 76A is all that remains of the records of that time taken by astro-science program students. On it lie the tracks of 26 meteors. From my own personal recollection meteors were seen to fall in every part of the sky. A mixture of all magnitudes populated the sky; some fireballs were seen which cast shadows. Several were green in color. It seemed as if the peak lasted around an hour with the rates increasing as dawn approached. This may correspond to the very high rates reported from Arizona, which was to the west of us. Regrettably the logs of the time are lost. This includes meteor counts and magnitude distributions. However, the rates that we estimated from the counts corresponded to a ZHR (zenith hourly rate) of 10,000 per hour. The shower activity that we observed described in later years were not nearly as prolific. There are 22 Leonids and 1 sporadic depicted from the following photo. 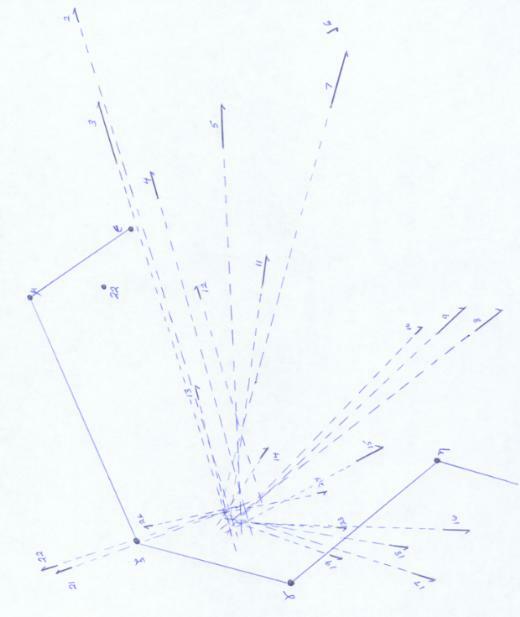 The origins are graphically depicted by dashed tracks showing the radiant areas. Note that there seems to be more than one radiant. This is a print from the original photo taken at Moore AFB near Mission, Texas. 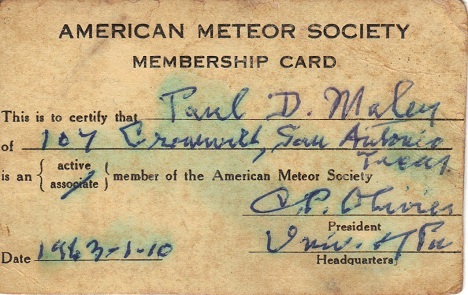 When I was 17 years old I became a member of the American Meteor Society. This famous organization was founded in 1911 by C.P. Olivier who inducted me into the AMS.